Come learn about food insecurities in West Baltimore with Project Insight on Monday, March 3, 2014 from 7.30-8.30PM in Math/Psych, Room 322. 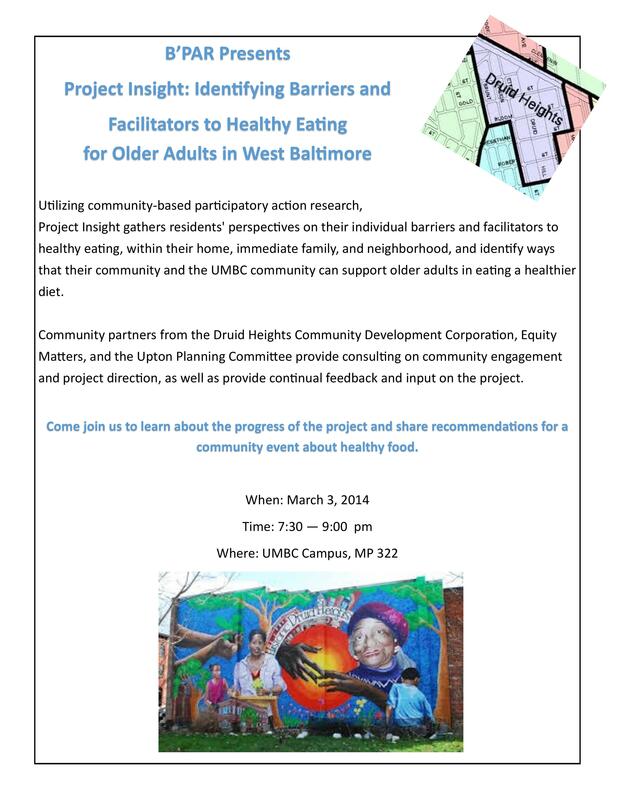 The objective of Project Insight is to gather residents’ perspectives on their individual barriers and facilitators to healthy eating, within their home, immediate family, and neighborhood, and identify ways that their community and the UMBC community can support older adults in eating a healthier diet. The project uses a community-based participatory action research approach, in which the community and researchers are equal partners in problem-definition, study design, interpretation and communication of results, as well as identifying and implementing actionable solutions. Find out more information on myUMBC.